We've had some middle of the road beers from 4 Sons before. City Sliquors has stocked a few of their beers, so I assume the all-powerful Jeremy likes them, and I just haven't happened upon the great beer that sold him on carrying them in the first place. I realize everyone has different tastes in beer, but I think (aside from sours and coffee beers) Jeremy and I are on similar pages. 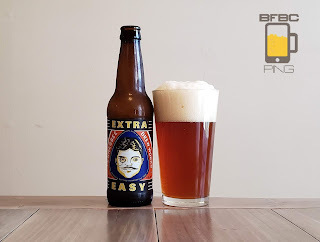 The brassy-gold beer has a white head that gathers in patches but is afraid to leave lacing like it feels like it's going to have to clean the glass afterward. The aroma is heavy with bread malt and light on any kind of surf-style hops that I really wanted to smell. First sip is very malty. The bread and cracker malt is thick and almost hits the taste buds like a brick. The hops are there, but they take a back seat and just kind of spread a bit of tropical and citrus in the back like a bass beat in a club that is dominated by the sound of screaming and keyboards. Mantra is a pretty good brewer, and they're a local brewer, so I like that. The fact that this can reminds me so much of the carrot beer that they made does not fill me with confidence. 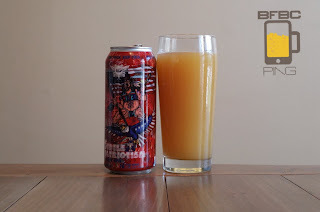 That said, peach and mango are the kinds of fruits that you might be able to pull from a particular strand of hop, so maybe they'll work some magic mixing this strange fruit juice and beer pairing. The very cloudy yellow beverage has a respectable amount of head that leaves incredibly sticky bubble marks on the glass that are definitely not lacing. The aroma is what it says it will be on the bottle with peach and mango dominating a more floral hoppy backing. If there's a malt trying to get out, it is fighting a losing battle. 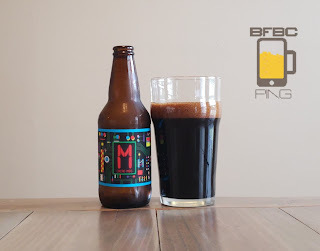 Mantra is another local brewery that is up there with CSB and Bearded Iris when it comes to potential. I recently swung by the brewery and was a bit disappointed that it seemed like a big tasting room and nothing else. I had some kids with me, and I'd expected a bit more. We went to CSB instead, and everyone had a good time. 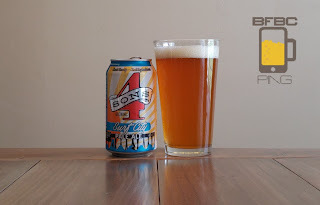 The lightly hazy gold beer has a sticky, patchy head of foam that totally screams IPA. The aroma is mostly doughy bread with citrus glaze spread pretty evenly, but there isn't as much aroma as I would like at all. I really have to get into the glass to smell it. First sip is quite bitter. 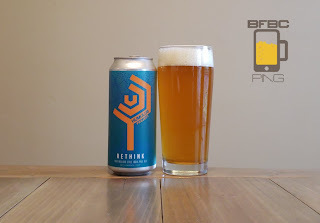 The hops are asserting bitterness, and there is orange and grapefruit to go with it, but the bread is really distant while that bitterness really takes hold of the mouth and asks if it can stay a while. The sip is a sharp knife to the tongue, and I don't like getting stabbed. When a new brewery comes onto the scene, I like to give them a leg up by starting with the IPA. Fact is, the IPA is a versatile style that can swing from hop-enraged to gentle and easy drinking. The hops can cover mistakes of the fledgling brewer, so it should be about the best beer they offer. Hell, it seems sometimes like it's the only type Bearded Iris even offers. Oh sticky head, how do I love thee? Thou art stickier than dew upon the morning grass or jealousy on the face of the middle sibling. Well, we've got a sticky and patchy off-white head on top of an orange-honey colored beer with thick clouds of yeasty oranges and apricot smells billowing up from its deep depth. Another Double IPA. I'm not complaining, but it seems strange that there are suddenly so many out there for me to try. For the longest time, the hipsters drove the hop-heavy IPA market, but they seem to have moved to sour beers. Are they also trying Double IPAs? I hope so; I want more. Do I even have to comment that a Bearded Iris beer looks like fruit juice with carbonation? I mean, they all do, don't they? It's orange, thick, and the head is white without much staying power. The aroma is mango and grapefruit with a dusting of crust. It's formulaic for Bearded Iris, but it's a good formula. First sip is crisp, but it has quite the after-bite of bitter. The fruits are fresh and all mixed together in a blended fruit punch of tangerines, oranges, grapefruit, and apricots. It's a good enough sip, but it would definitely turn some people off. I can't say enough about Stone that they'll never read. I mean, I'm a tiny little blog, and they seem like they are on the cusp of becoming too large to be considered a "craft" brewery at this point. They put out so much beer, and it's so good, that it will come eventually. The thing is this: we will all be better for it. They know their stuff. The beer is self-evidently unfiltered, as it has little white bits suspended in the already very hazy beverage. The thick, sticky head leaves more lacing than I expected or deserve. I love the look of this beer. The aroma is a biscuit malt with light citrus dancing on it. This is going to be fun. First sip is delightful. 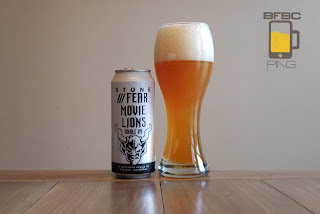 It has very nicely muted (but strong) citrus with a mix of grapefruit, mango, orange, tangerine, oats, and then the bitterness and tartness rise up and slap things down, but oats and pine rise up to meet it. Tailgate knows how to make beer. The fact that they're a local Nashville brewery is just a bonus. The can art is... interesting. There's way too much to unpack on it from the oriental with the fu-man-choo and american flag vest to the noticeable pre-9/11 NYC skyline. Seriously, there's too much to unpack. They're not kidding when they call it hazy. This is hazy and dense. 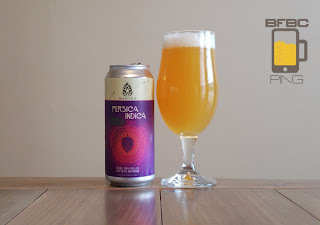 Now, Cammo told me once that you get a hazy beer by just adding wheat at some point in the process, and I expect he knows what he means, but I'm not sure all of the Bearded Iris beers were heavy on wheat or grains. Let's skip the head - there isn't much, and it runs away scared. The aroma is lots of fruits - tropical and citrus. I can practically taste the mango from just having the beer sit near me. This is going to be good. 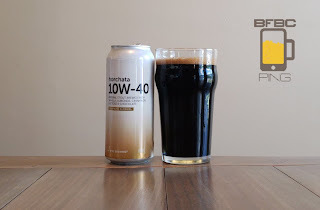 When beers start to call themselves things like Pothole Filler and W00tstout, it becomes apparent that marketing is integral to the success of a good beer. Yes, Budweiser can sell itself on pure Americana (with a Czech name) but most other brewers have to work for it. So, claiming to be a kind of oil intrigues me enough to try this out. The fact that Hi-Wire's summer lager was so good means that this is tracking pretty good. Black as the oil from which it gets its name, the beer has a brown head that disappears quickly and leaves a soft dusting of bubbles on top and around the ring. The aroma is thick with chocolate, vanilla, and spices. It smells damn good. First sip definitely includes almonds. I almost expected the sweet smoothness of a milk stout, but this one is definitely the imposing malt of an imperial stout. It has those almonds almost mixed into almond milk and then added to the chocolate's bitterness. This brewery has bounced around a bit, but their highs are higher than their lows. I approach this beer with more than a little trepidation. This was the last beer that I'd been putting off drinking in my beer fridge. Once I do this one, the rest are all new beers - no holdover reviews (I do still have some beers in there that are already reviewed). I didn't expect red. This is a red beer made with blueberries. BLUEberries. But, no, we're looking at a red beer, alright. The pink head fizzles quickly, and the very scant patch of bubbles remaining are notably small. The aroma is very strong sour fruits, but I think I smell cherries more than blueberries. I like both fruits, but I dislike sour, so I don't know what will happen next. The nature of my relationship with beer is that I don't like sour beers. 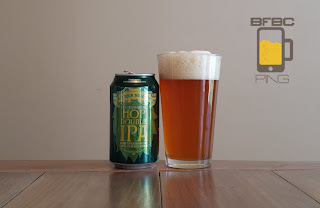 I really enjoyed the surge of hipster hop-heavy beers, as it aligned with my likes. The fact that the hipsters have moved on to sour beers means that our relationship is at an end. This doesn't mean my relationship with Uinta is ended, though, so I figured I'd just try it out. This is a pretty beer. The presentation is certainly helped by the tall glass that was part of the set the wife bought for me. The color is more interesting than normal - it goes from yellow-gold at the bottom to a slight red tint at the top. The head is fleeting, but it keeps getting fed by a very carbonation-heavy beer underneath. The aroma is sour cherries; it's the let down in an otherwise good presentation. First sip is sour nonsense with a heavy bread backing. It's got a dry tartness to go with the sour, but this is exactly what I'm not looking for in a beer (this side of coffee). It was a mistake to buy this. Prairie Artisan and I have a very simple relationship - they make beer and I try the beer. Most of the time, I have disliked their hipster-centric ethos and "artistic" interpretation of how beer is made. However, Jeremy (the proprietor of City Sliquors) convinced me to pay actual money for this beer and the other Deconstructed Bomb beer. The last one wasn't the worst ever, but I had a KBS after it, and the KBS just worked in all the ways the Bomb didn't. Let's try this sucker out. The very deep brown beer has a cap of brown suds that leave not a bit of lacing as it recedes so darn quickly. The aroma of sweet chocolate, oak, and syrup emanates pretty wildly from the top of the nearly naked beer. It's rich and full of alcohol. Yes, the aroma is full of alcohol. I said it - come at me, bro! I blame Jeremy for this beer and the next one. I didn't want to try another Prairie Artisan beer after the crapfest that have been their beers so far, but he assures me that these will be much different than the others, and I rely on his expertise in these matters. So, I am willing to let them rescue their reputation. 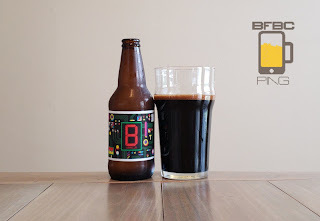 The very dark brown beer has a dark brown head that is pretty thin and dissipates very quickly. The aroma is very heavy alcohol, wood, and vanilla on top of what seems to be a smoky chocolate malt. The alcohol in this beer is 11.8% ABV, and that is quite high, but not all beers that have that high (or higher) alcohol content reek of alcohol like this one does. First sip is not bad. It's heavy with the alcohol and there is definitely some smoke and chocolate malt mixed with vanilla and oak. It reminds me a bit of the Goose Island version of this beer, but it comes off as a bit more stolid than the Goose beer. The last of the 'experimental' beers, I figured out that the experiment is some kind of odd hops from the mountains of... Oregon? Washington? Mississippi? I dunno. I don't really care that much, either. Let's see how the experimental hops work to give me some kind of superpowers. She's a pale yellow beer, as any respectable pilsner would be. The thin head leaves more lacing on the sides than any pilsner I can recall, and that may be from the hops. 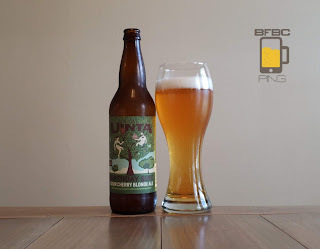 The aroma is a pleasingly sweet citrus with lemon and an earthy backbeat. I've come to this party for a hoppy pilsner, and it appears I've found one. First sip is very laid back and pretty nice. 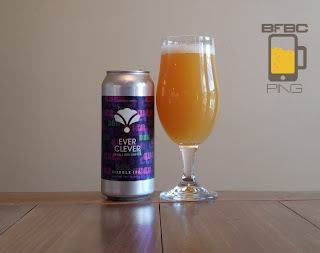 I could definitely see this as a sipping beer with the low citrus, earthy pine and lemons all nestled together in a relatively sweet beverage. 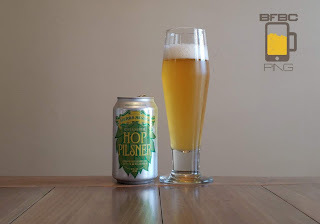 It's smooth and creamy for a pilsner, and it is highly approachable. Third of Four would be this beer's Borg name. The first experimental beer was a very good effort. The second beer should probably have stayed in Nevada (or California or North Carolina or wherever it was made). This, then, is the penultimate experimental beer, and it has a hole to dig itself out of. The light straw colored beer with a fluffy head strikes me as a wheat beer on looks, and the aroma has lots of lemons in it to back up that first look, but the bread in the malt isn't grainy enough, so "session" it is. I guess they know what they're doing when it comes to naming these things. I try not to judge these beers based on amount of alcohol, but 4.6% ABV is pretty tame. I was nearly affronted by the paltry 6.7% of the first 'experimental' beer I had. Another Experimental Hop beer, and the first one has made me expect odd and great things. I think I understand now - lower expectations with the label 'Experimental' and then do whatever you want and hope that it comes out well. If it doesn't - it was labelled 'Experimental' so you get what you get. If it comes out well, the experiment is a success! The copper beer has a head that is considerably stickier than its brother. The aroma is rather malty, as you might expect for a DIPA, but the citrus brightness is definitely contributing to the rather delightful presentation. I wanted a beer when I opened this, and I want a beer even more now. This is the first in my new four-part series called "What the heck is this?" This first one is an 'experimental' hop IPA. 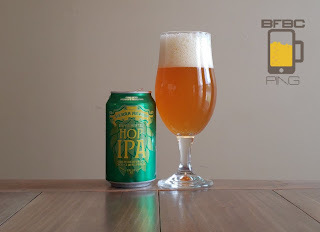 Now, I'm not sure why they feel the need to slap this label on this beer, but adding hops to an IPA is pretty much what built Bearded Iris and a few other brands, so this isn't really something new... or is it? The coppery-gold beer has a white head with an orange vibe. 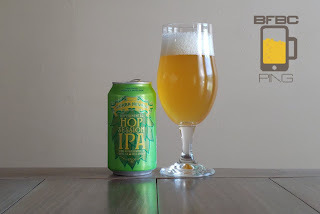 The head is leaving lacing, and that's certainly something I look for and expect from an IPA. The aroma is more musty bread than I expected, but it is only background from the orange and grapefruit hops up front. This is going to be good. First sip is very dry, but it's also very juicy. That orange, grapefruit, tangerine, and even a bit of mango is all mixed up in a somewhat bitter, dry mix. The malt is bready, but it's only cutting the bitterness by the tiniest portion. These dogs have been excellent. 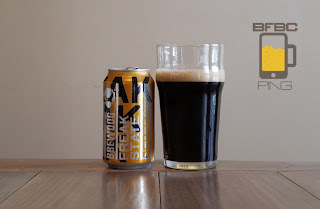 I'm not exactly sure what the whole process was for this Scottish brewer to start brewing stuff here in the US, but it seems like were getting the best of what Scotland's beers have to offer. I mean, if Scotland has better beers than this to offer, they need to start importing that stuff now. True to its name; this beer is black. It's not as black is some other beers that claim to be ruby or brown, as it has quite a bit of brown leaking through around the edges - especially around the light tan head that leaves a reluctant amount of lacing that eventually works its way down the sides of the glass to the edge of the beer. The aroma is flour. I would've expected floral or citrus, but this is mostly bread flour with a bit of caramel malt coming through.